The subtle, sweet and sour marinade, which is made in minutes, caramelises with the salmon over the heat of the fire, making this a wonderful alternative for the barbecue. Make sure the skin is scaled but left on, as it crisps well and protects the delicate flesh while cooking. Prepare the barbecue. For the marinade, mix the soy sauce, vinegar and oil together with the fresh and ground ginger, garlic and sugar in a large, clean ziplock or freezer bag. Make several shallow slashes, about 5cm long, with a sharp knife through the skin of the salmon. Then place the fish in the plastic bag, close tightly and turn several times to coat well and prevent sticking. Leave to marinate in the fridge for between 30 minutes and 2 hours. When you are ready to barbecue, season the salmon with pepper and place it on the hot grill, making sure it is not in direct contact with the flames. Cook for 6-8 minutes then turn over carefully and cook for another 6-8 minutes until the flesh is opaque and just flaky. 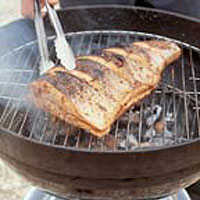 Remove the fish from the barbecue and leave to rest for 3-5 minutes before serving. To roast the salmon in the oven, preheat to 220°C, gas mark 7. Roast uncovered on a double layer of foil for 10-15 minutes on each side until the salmon is cooked through. If you can't get a whole piece of salmon, sandwich two even-sized fillets together when cooking, with the skin sides facing outwards. Allow about 180g per person. Cooked leftovers can be covered and chilled in the fridge for up to 24 hours. Do not reheat. Sprinkle the cooked salmon with 2 teaspoons toasted sesame seeds, a few drops of Waitrose Toasted Sesame Oil and lemon juice before serving. If you don't have time to make your own marinade, try Nando's Lime and Coriander Marinade.